Two miles north of Sister Bay and before Ellison Bay is where youll find us. 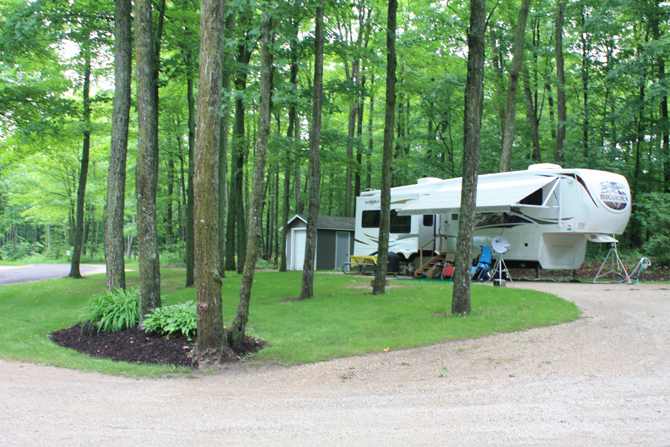 Located right off of Hwy 42, we offer wooded and spacious campsites to accommodate every size tent, camper or RV. A majority of the sites feature water & sewer hookups and 20/30/50 amp service. Pull through sites are also available. Other services include garbage pick-up, bathrooms, free showers, picnic tables, fire rings, firewood ($) and fish cleaning. Open May 1-Nov. 1 for Daily, Monthly, Seasonal camping.